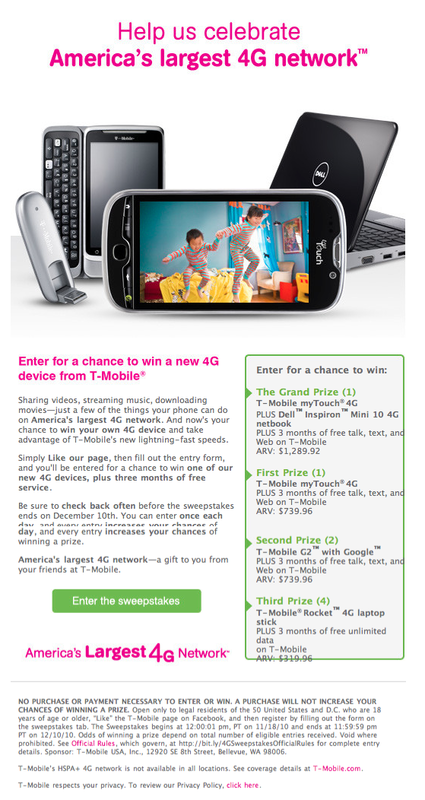 T-Mobile is looking for some help celebrating the nation’s largest 4G network by giving stuff away. Nothing says “help us celebrate” better than free stuff! In this case, the “stuff” is a Grand Prize of Dell Inspiron Mini 10 4G with three free months of service! The First Place winner will take home a myTouch4G with three free months of service! The Second Place winners will have a chance at winning one of two T-Mobile G2 4G smartphones! Last, but most certainly not least, the third place winners will have a chance to win one of two T-Mobile Rocket 4G laptop sticks which comes with, surprise surprise, three free months of service! So what does one have to do to qualify? “Like” the official T-Mobile Facebook fan page and fill out a brief form and you are qualified to win! It’s that simple. No purchase is necessary and you must be 18 or older to enter but hit the link for the full rules! ← Verizon Claims Fastest 4G Network; How Should T-Mobile Respond? Maybe instead of claiming to be the “largest 4G” network t-mobile should try and be the best mobile network. Just because your “large” does not mean you work well. A little less time bragging and a little more time making it work would be a novel idea. Check out the “T-Mobile Boycott Page” on Facebook for the latest scams, lies, lawsuits, class actions along with One Click Links to State, Federal and Consumer Protection Agencies. but yea, hopefully I win!! The T-Mobile Facebook Boycott Page looks like nothing more than someone who feels the need to spread his own version of lies based on some vendetta he/she has by a company that in his/her eyes wronged him in some way. That page is nothing more than a skewed version of stories that they are spinning to show in the worst way possible. For example you take an article about T-Mobile discussing working to resolve customer issues and you spin it in the view that T-Mobile has customer issues all while ignoring the main point. Sounds more conspiracy theory than steeped in truth. @Bad Tmobile… I haven’t gotten anything but fantastic service from tmobile (both customer & cell) so go spread your rhetoric else where. That facebook page is a total joke. You know ANYONE can make a facebook page right? 37 fans?? cmon. Please never site that as a source to back up your hysteria. Read the fine print. It says the sweepstakes start at 12:01 p.m. PT (Pacific time). The contest doesn’t start until 12:01 PST on 11/18/10 (today) try the enter button after that. Doesn’t work. You click on ENTER NOW but nothing happens. It doesn’t start until 12:01 PST. Great… something else that does not work when we see it!!! Why do they put up stuff that will not work until the next day???? SWEEPSTAKES BEGINS AT 12:00:01 AM PACIFIC TIME (“Pt”) ON November 18, 2010, AND ENDS AT 11:59:59 PM PT ON december 10, 2010, (THE “PROMOTION PERIOD”). DO NOT ENTER THIS SWEEPSTAKES UNLESS YOU ARE ELIGIBLE AND LOCATED IN THE 50 UNITED STATES or D.C. AT TIME OF ENTRY. Actually it says 12:00:01 PM PST. But it still isn’t working now. For those of us who won’t ever join FB this is junk. Set up a link on the t-mobile home page so anyone can join in the fun. Tired of this FB s@!t. YES, what about us un-Facebooker’s? Thanks for reviewing about a Dell mini. I have look over on a dell mini 10 phones and get some fabulous offer with it. I think it’s a good deal with this phone.